I have been thinking a lot about bravery recently. It probably began last Friday, standing on the side of the street documenting Israeli military assaults on Palestinian protestors. I heard a thud as a bullet slammed into the metal door up the street, and turned to look at my teammate with confusion — was that really a bullet? — when several rubber bullets came skipping up the street and stopped near my feet. At that moment, I realized that I would hate telling this story to friends in the United States. We were accompanying the annual Open Shuhada Street demonstration Shuhada Street, once the main market street in the old city of Hebron, is a desolate ghost town since the Israeli military closed it to Palestinians in the late 1990s, as punishment for protesting the massacre of 29 Muslim Palestinians in the Ibrahimi Mosque. Every year, Palestinians and international supporters gather to demand that the Israeli military open the street and allow Palestinians to move freely in the city. Every year, they are met by brutal, violent repression. 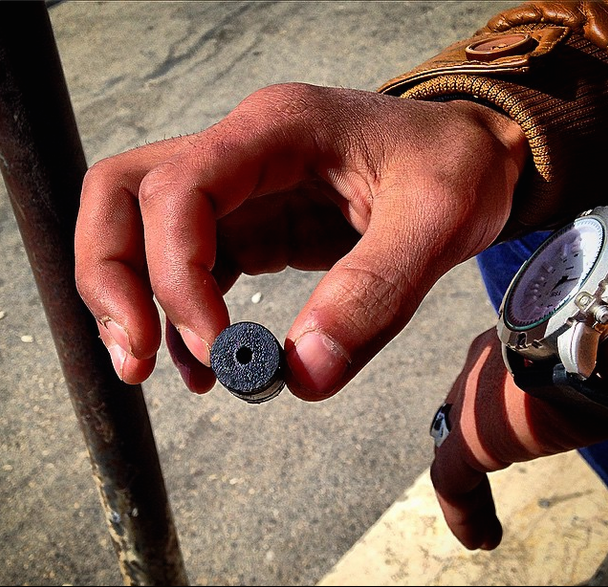 As I walked over to pick up the rubber bullet, I looked across the street and saw several young Palestinian men my age, trying to decide if it was worth attempting to march down the street or not. And at that moment, I understood why I would hate telling this story. The truth is, I’m actually scared of a lot of things — bullets, heights, snakes, big spiders, etc. I am very sure that I would not be out protesting if I was a young Palestinian man, growing up with constant military harassment, family arrested and tortured, friends killed, economic strangulation. I felt safer on that street because of my CPT hat and my international passport. We can always find someone braver than us, someone who is sacrificing more. And often people do not sacrifice by choice, and they are brave because their very existence is resistance and there is no third option between resistance and death. Those of us who do not face this choice can find ourselves seeking moments of bravery, opportunities to prove our toughness by facing down the forces of violence — the white/male/middle-class/USAmerican Savior Complex. Thomas wants to be brave. He identifies the movement Jesus is building as about bravely facing death (unlike Peter, who at other points thinks that Jesus is an idiot for saying he will die, cf. Matthew 16). Thomas sees Jesus’ death as the central focus. Thomas would do well in a conservative evangelical church. But this is not the story in John 11. Jesus does head down to Judea, and Lazarus has been dead for four days. If the point is a brave death, Jesus could have just sat down and waited for the political leadership to show up and kill him. Instead, he weeps with his friends in the death of their friend, he goes with them to the tomb, he asks for the stone to be rolled away, he prays, and Lazarus is raised from death. And then Jesus says this: “Unbind him, and let him go.”Jesus frees Lazarus from the power of death. This message, this Good News, gets shouted throughout the Gospels and the letters of Paul — the movement is about conquering the power of death. Jesus does not come to Judea to bravely face death, but to bring life into the midst of death. His call is not to die bravely, but to live freely. I know that our friends in Youth Against Settlements, Hebron Defense Committee, and other organizations, don’t go to protests to get shot. They go because they are alive, and to live freely is to resist the forces of death. The Palestinian resistance, stretching back since before the ethnic cleansing of 1948, has been struggling to live freely and resist death for many decades. This month marks the 50th anniversary of the march from Selma to Montgomery in the United States, another movement moment where people decided to live freely. And many of them paid for it, just as Palestinians and oppressed people everywhere cannot live as they want without violent attacks. And this is a lesson that all of us do well to remember. We do not win if we go out onto the streets looking to bravely face death. Though we may face bullets and repression, we go out because we are alive. As Easter approaches, I have this to say to the forces of death all around me — expect resistance.